مهرنیا, سید رضا, ابراهیم‌‌زاده اردستانی, وحید, تیموریان, اصغر. (1392). استفاده از روش برخال‌‌ برای تعیین چگالی بوگه لوح‌سنگی در منطقه چارک (جنوب ایران). مجله ژئوفیزیک ایران, 7(1), 34-50. سید رضا مهرنیا; وحید ابراهیم‌‌زاده اردستانی; اصغر تیموریان. "استفاده از روش برخال‌‌ برای تعیین چگالی بوگه لوح‌سنگی در منطقه چارک (جنوب ایران)". 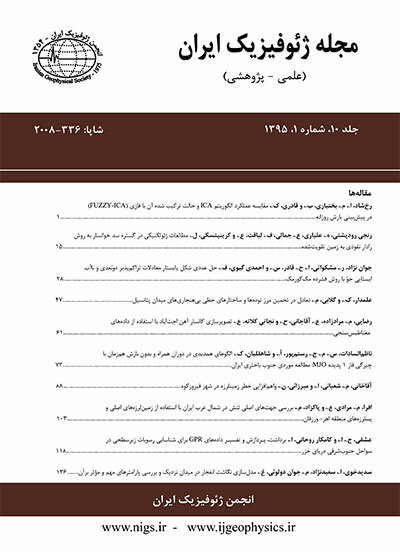 مجله ژئوفیزیک ایران, 7, 1, 1392, 34-50. مهرنیا, سید رضا, ابراهیم‌‌زاده اردستانی, وحید, تیموریان, اصغر. (1392). 'استفاده از روش برخال‌‌ برای تعیین چگالی بوگه لوح‌سنگی در منطقه چارک (جنوب ایران)', مجله ژئوفیزیک ایران, 7(1), pp. 34-50. مهرنیا, سید رضا, ابراهیم‌‌زاده اردستانی, وحید, تیموریان, اصغر. استفاده از روش برخال‌‌ برای تعیین چگالی بوگه لوح‌سنگی در منطقه چارک (جنوب ایران). مجله ژئوفیزیک ایران, 1392; 7(1): 34-50. روش متداول برای تعیین چگالی لوح سنگی، استفاده از الگوی نتلتون با هدف سنجش میدان گرانی مستقل از نشیب و فرازهای ساختمانی است که به‌‌طور موردی و به‌‌دلیل ضخامت زیاد پوسته در زاگرس چین‌‌خورده (جنوب ایران)، موجب افزایش خطا در خلال فرایند تصحیح می‌‌شود. از این‌‌رو تعیین مکان هندسی بی‌هنجاری‌‌ها نیازمند سنجش دقیق‌تر تغییرات گرانی به روش‌‌های غیرخطی است که پس از جمع‌‌آوری اطلاعات زمین مرجع و درون‌یابی داده‌‌ها، رابطه برخالی (فراکتالی) پراش‌مسافت با هدف تقریب چگالی لوح سنگی محاسبه می‌شود. نتیجه این تحقیق، دستیابی به کمیت‌‌های مستقل از روند هم‌ایستایی گوشته در سازندهای رسوبی منسوب به تاقدیس چارک است که به‌‌دلیل بهره‌گیری از تابع‌های نمایی در شناسایی مولفه‌‌های گرانشی متناظر، درحکم روشی نوین برای تقریب چگالی 4/2 کیلوگرم بر متر مکعب در بخشی از میادین نفتی استان هرمزگان پیشنهاد شده است. A common method to determine the Bouguer density value as a random variable independent from topographic alternations has been introduced by Nettleton algorithm. During the correction processes, it may casually be accompanied by unexpected errors, for example in the folded region of Zagros, as a result of crustal thickening processes in the Southern regions of Iran. Sedimentary sequences in Charak-Namakin anticlines are known as important geological units which have been selected for prospecting oil related reservoirs by the National Iranian Oil Company. Gravimetric datasets have been acquired by this company through systematic land surveys in a total of 776 stations. The main target areas along Charak - Namakin salt domes are geographically located between 54.00 - 54.30 degrees of longitudes and 27.00 - 28.45 degrees of latitudes. Both Asmari (Oligocene) and Pabdeh - Gurpi formations (early Cenozoic) contain limestones with gray marls intercalations as a potentially valuable facies for hosting of hydrocarbore reservoirs under ascending movements of the Paleozoic formations in diapiric systems. Hormoz series (Cambrian) containing gypsum and other related evaporates play the main roles for oil trapping processes after arriving the emigrant volatiles to the permeable layers nearby brecciated structures. Determination of the optimum Bouguer density so that it is only related to Charak geological impressions is an important procedure which associates a number of gravimetric anomalies with probable oil trap locations. It means that Bouguer anomalies are comfortable geophysical quantities for density estimations according to statistical techniques. Although a linear method such as Nettleton correction can be used for density estimations, some abnormal thickening of the crust may increase in topographic disturbances and subsequently cause stochastic behaviors of the gravity values which cannot be interpreted by Euclidean geometry. Therefore, nonlinear analyses such as power law functions can be used to calculate the fractal dimensions as non-Euclid variables related to self similar peculiarities of the gravimetric values which are theoretically assumed to be spatially independent from crustal interactions with heavy masses of the lithosphere. According to Mark and Aronson, two fractal-based interpretations corresponding to gravimetric anomalous regions have been carried out by applying a variance – distance logarithmic equation in Free Air and Bouguer georeferred datasets, respectively. This research is an attempt to study the Brownian surfaces as unique area indicators to cumulative appearances of the gravimetric similarities above Charak sedimentary formations. Given the iteration processes on the log-log plots, some Bouguer anomalies have been recognized to be independent from topographic alternations in the ranges of 6.44-10.24 km distances from backgrounds. As a result, an averaged density value equal to 2.4 kgm-3 was calculated for Charak lithological occurrences by a stepwise fractal analysis of the total density assumptions (1.8-2.4 kgm-3). The fractal result was subsequently compared with the statistical result considered to be in a range of 2.3-2.4 kgm-3 as optimum density values for the Hormozgan Region after obtaining a new ratio of Bouguer regression versus the Bouguer Poisson coefficient (R2P) among estimation processes. تلفورد، دبلیو، جلدارت، ال.، شریف، ار. و کیز، دی.، 1989، ژئوفیزیک کاربردی، ترجمه: زمردیان، ح.، حاجب حسینیه، ح.، انتشارات دانشگاه تهران، 1، 696 . فرمانی، ف، 1382، گزارش اکتشافات گرانی در منطقه چارک – نمکین، شرکت ملی نفت ایران، 129. مانلی، بی.، 1990، آشنائی با روش های آماری چند متغیره، ترجمه: مقدم، م.، انتشارات پیشتاز علم، 257. Kaviani, K., 2003, Moho depth variations beneath Central Zagros (Iran), inferred from teleseismic Receiver functions: EGS - AGU - EUG Joint Assembly, Abstracts from the meeting held in Nice, France, abstract #10373. Mandelbrot, B., 2002, The Fractal Geometry of Nature: 21st Printing, W. H. Freeman and Company, New York, 468 pp. Mark, D., and Aronson, P., 1984, Scale-dependent fractal dimension of topographic surfaces: An empirical investigation, with application in geomorphology and computer mapping: Mathematical Geology, 16(7), 671-683. Pfeiffer and Obert, 1989, Fractals: Basic Concepts and Terminology: D. Anvir edition, John Wiley and Sons, Chi Chester, 11-43. Thorarinsson, F., and Magnusson, G., 1990, Bouguer density determination by fractal analysis: Geophysics, 55(7), 932-935. Turcotte, D., 1997, Fractals and Chaos in Geology and Geophysics: 2nd edition, Cambridge Univ. Press., 398 pp. Yamini Fard, F., and Hatzfeld, D., 2008, Seismic Structure beneath Zagros-Makran Transition Zone (Iran) from Teleseismic Study: Seismological Evidence for under thrusting and Buckling of the Arabian Plate beneath Central Iran: JSEE, 2(15), 236 – 252.